The Celestron binoculars line not only includes their Celestron birding binoculars, but a complete range of sizes from the compact and lightweight UpClose series, all the way up to the impressive 100mm SkyMaster Series. Granite ED binoculars are Celestron's best, featuring ED (Extra-Low Dispersion) glass for improved sharpness and color correction. 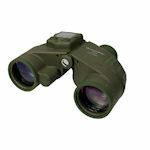 Ergonomic, double-bridged Granite ED binoculars are roof prism designs available in 33-mm mid-size, 42-mm full-size and 50-mm plus sized models. 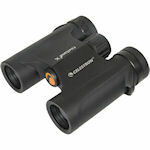 Celestron TrailSeeker ED binoculars are lightweight, affordable, ED binoculars with excellent specs for birding. They come in 8x42 and 10x42 models. A full set of accessories includes both a strap and a harness. Celestron Trailseeker binoculars are phase- and dielectric-coated and made with BaK-4 prisms for the sharpest, brightest images. They have lightweight magnesium-alloy chassis, and are sealed to be fully fog- and waterproof. Trailseeker binoculars are available in 32-mm mid-sized and 42-mm full-sized versions. 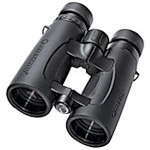 Celestron Nature DX binoculars are phase-corrected roof prism binoculars at a budget price. 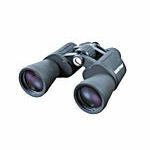 Nature DX binoculars all have great close-focus capability and a wide field of view. 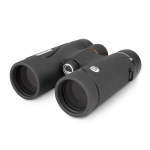 Available in compact, mid-sized or full-sized version, Nature DX binoculars are lightweight, fog- and waterproof. 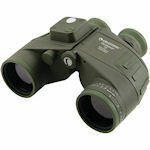 Celestron Cavalry are tactical porro prism binoculars designed for hunters, boaters, law enforcement, and military personnel. Made with BaK-4 prisms and fully multi-coated optics for bright, sharp images, Cavalry binoculars offer intrinsic compass, reticle and GPS options. 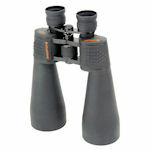 Celestron Cometron Binoculars are designed to make comet watching easy for even novice sky watchers. Their wide fields of view let you know where you are among the stars so you can find the objects you seek. 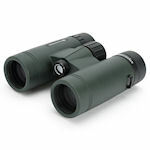 Celestron Echelon 70mm Binoculars feature BaK-4 porro prisms and fully multi-coated lenses designed for long range viewing. They are waterproof, nitrogen purged, and rubber armored. Echelon binoculars are assembled in the United States from Japanese parts. 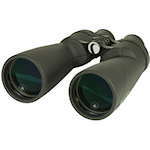 Oceana are Celestron's 7x50 marine binoculars, made with BaK-4 porro prisms, and multi-coated lenses. Designed to be rugged for the marine environment, Oceana binoculars are heavily armored, and waterproof, with an available built-in compass and limited lifetime warranty. 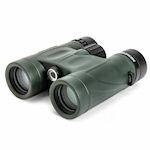 Celestron Outland X binoculars are optics roof prism designs with multi-coated optics and BaK-4 prisms for bright, crisp views. Outland X binoculars are fully waterproof with large focus knobs for easy and precise focusing and twist-up eyecups for quick eye relief adjustment. 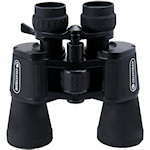 Celestron SkyMaster binoculars are large aperture, high-power astronomical binoculars. Made with BaK-4 porro prisms, multi-coated lenses, SkyMaster binoculars bring the heavens down to you. SkyMaster binoculars are backed by a limited lifetime warranty. Compact and full size binoculars at economical prices, roof and porro prism models, rubber covered, water resistant, limited lifetime warranty.